In an unmarked area gather your players without their soccer ball (you can introduce this later in this drill). The coach should come up with a short list of activities such as skipping, one-legged hops, star jumps, log rolls, summer salts, push-ups, etc. 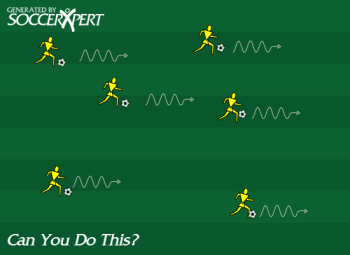 The coach should start by asking the players "I can do [activity] can you?" The coach should then demonstrate to the players the activity and have the children do the same. Allow Children the ability to explore their body movements. Make it fun for the children! Titled: Can You Do This?